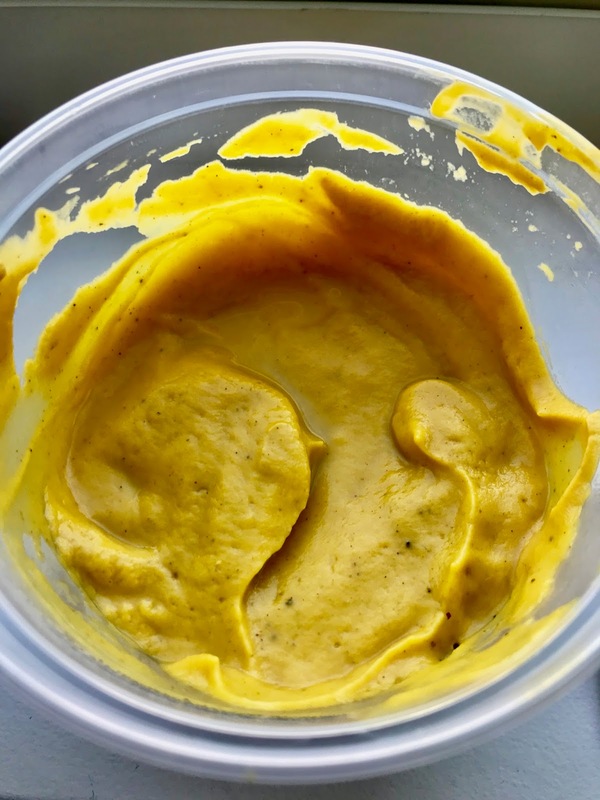 So, I SWEAR I actually have been cooking things over the past year, but this blog just seemed to get away from me (which is NOT okay!). That being said, we're making a revival - and by we, I mean me. There have been some career changes, moves being had, and all the fun stuff that life brings us over time. But fortunately, I'm back in a position where I have to let my culinary juices flow again (no pun intended). That being said, let's hop to it! I'm still sticking to the good old seasonal deliciousness. So you know what that means in terms of flavor profiles! 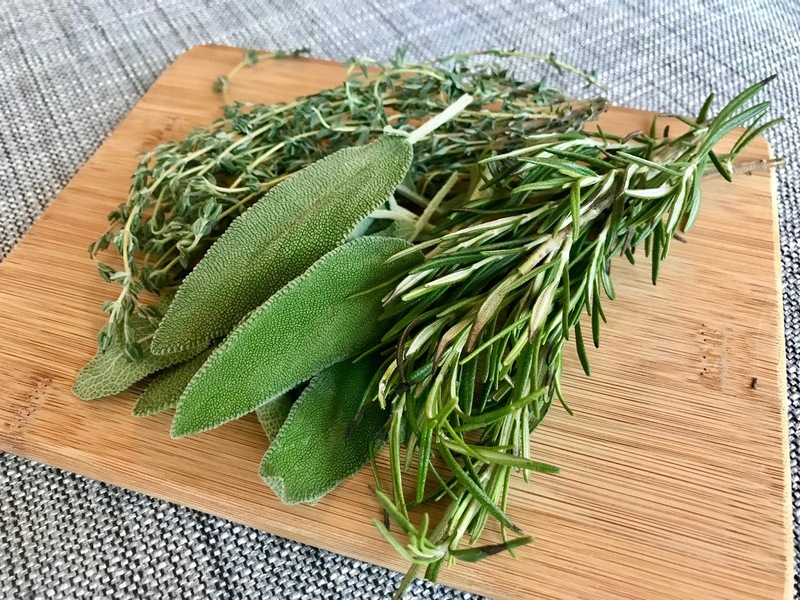 Our favorite winter time herbs: sage, thyme, rosemary. Our old pal, squash - read: pumpkin. And of course, one of my favorite cruciferous vegetables/brassicas - brussels sprouts! I would say it's definitely easiest to make the puree and the brussels sprouts leaves ahead of time, so you can focus on the chicken itself! That way, you also won't have a million and a half dishes to clean all at once. If you're cooking all in the same day, pat your chicken dry and season with a good amount of salt on both sides. Refrigerate until ready to cook - be sure to take the chicken out about 20 min before you want to cook it to allow it to come closer to room temp. This will allow the chicken to cook more evenly throughout. For the crispy leaves - preheat the oven to 350F. Slice the base of the brussels sprouts off, and the leaves should come off easily. If you often cook whole brussels sprouts, I'm sure you always get those stray leaves that go falling off and flying around! These are what you want. 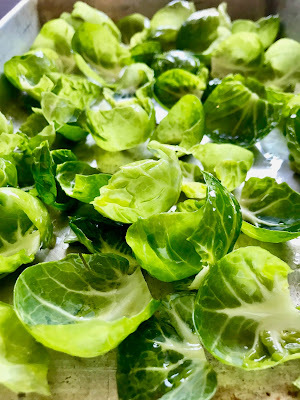 Don't get too aggressive trying to get the leaves off - just take the outermost leaves, and utilize the "heart" of the brussels sprouts for something else. 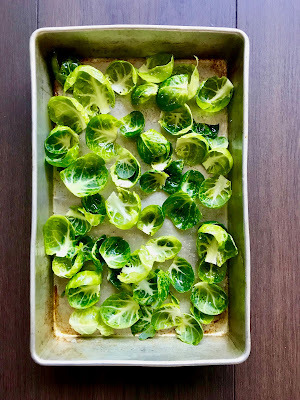 If you want, you can just halve the brussels sprouts and roast them whole as opposed to utilizing just the leaves, but that's a different story! Next, toss the leaves in olive oil - you'll have to get a little dirty with your hands here, tossing to ensure that the leaves are individually fully coated, and also not stuck together. Season with a sprinkle of salt. You're essentially "oven-frying" these bad boys. If you somehow have a fryer, or want to fry them on your stovetop, definitely do so! I'm not a fan of all the oil used, not the "fried" smell that lingers when frying items, so I tend to stray away. Roasting the leaves in the oven still allow them to achieve a super crispy texture, but also get a little but of a nutty flavor on the way! Keep an eye on the leaves - timing is fully dependent on the size of the leaves (about 10-15 minutes). They'll get a little brown, which is fine - it adds flavor! Once they're nice and crunchy, remove from the oven and spread out on a paper towel. This will soak up and remaining olive oil, but also will ensure they stay crispy and don't become soggy! Set aside. For the puree, bring a pot of water to a boil. You can either steam or boil, these bad boys - whichever you prefer. If you're steaming, you'll only need about 2 inches of water in your saucepan. If boiling, you'll need enough to cover the florets - and make sure to season the water with a good amount of salt! Cook the florets until fork tender. Remove (reserve the water!! ), and add to a blender (Vitamix is best here because it helps achieve a light, velvety texture by incorporating air into the puree - a regular blender, food processor, or immersion blender will work just as well. Slowly add the cooking liquid until you achieve a chunky puree. Add in the pumpkin puree and maple syrup, and blend again. Slowly add more liquid until you achieve the consistency of a thick soup. Season to taste with salt and pepper! Reserve. Now for the main event! At this point, the chicken should have been sitting out for about 20 minutes or so. Prior to cooking, slide your hand between the skin and the thigh, separating the skin from the meat itself. Place one sage leaf under the skin of the drum, and another under the skin of the thigh. This move is going to give a lot of flavor to the chicken, and also a pretty cool look once cooked! Heat up a cast-iron (or large skillet) over medium heat. Drizzle in about 2 T olive oil - you don't need much since the fat will be rendering, but you want to help out the chicken a little bit! 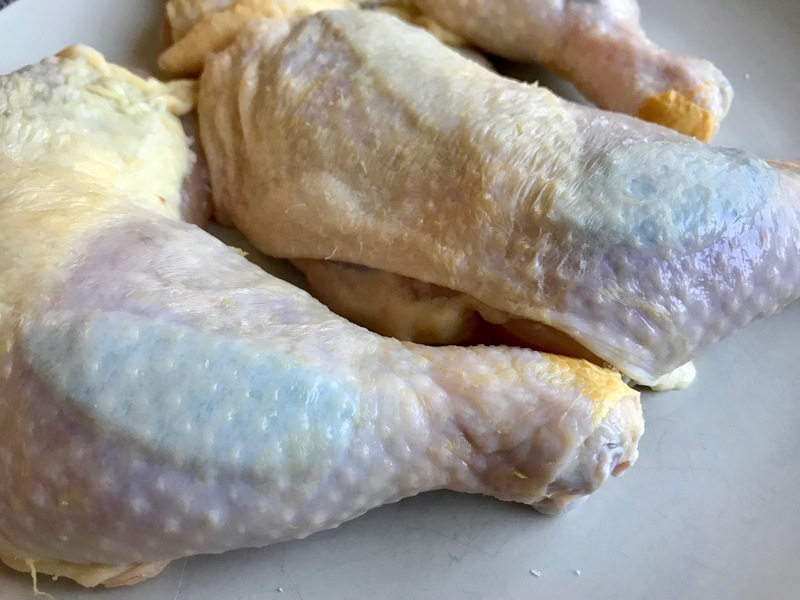 You also don't want this to get TOO hot since you have to cook the chicken for quite some time to achieve a crispy skin, cooked through, without actually burning the skin. 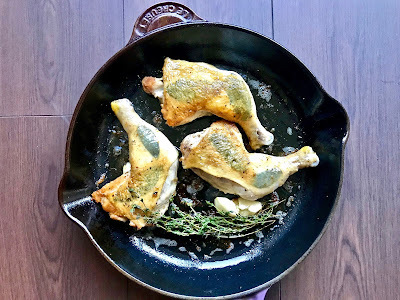 When the oil is heated, place the thighs skin side down into the oil - you should hear a light sizzle, but nothing too aggressive (I recommend using a splatter guard because the oil will still get all over the place!). Let the chicken cook on the skin side until the skin is crispy and golden brown, about 15-20 minutes, and flip. Allow the chicken to cook another 15 minutes until crispy on the bottom side as well. PRO-TIP: if you have something heavy, USE IT, so you're essentially making "brick chicken". This allows more surface contact and also helps achieve a crispier texture. I don't personally have a brick, so I tend to create a makeshift leaning tower of Pisa. Today, I used a crepe pan as a base, and placed my Le Creuset doufeu pot on top. Nice and heavy! About 10 minutes into cooking the second side, melt your tablespoon of butter, and toss in the thyme sprigs and garlic cloves. 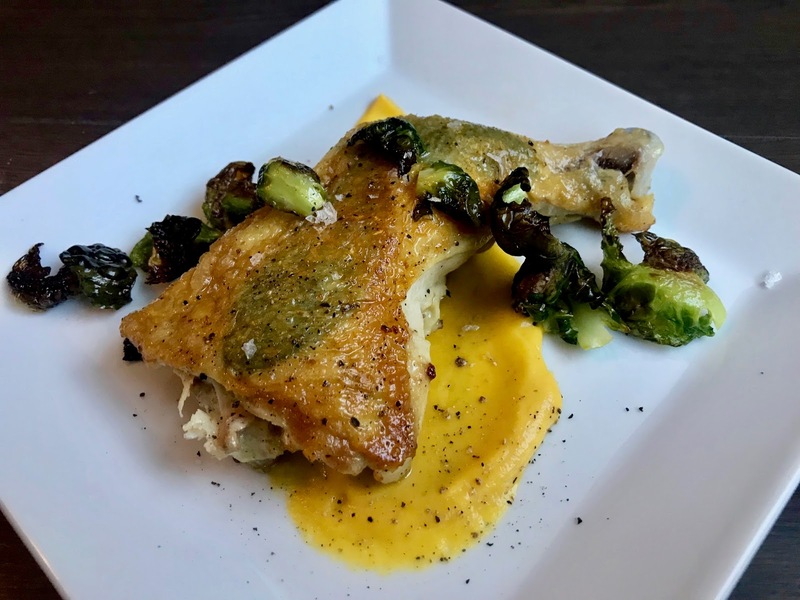 At this point, you're going to want to "baste" the thighs with the infused butter, tilting the pan and spooning it over each thigh. Allow to cook until the juices run clear internally. You MAY have to finish these in the oven depending how thick your chicken thighs are - I've had to use both routes. Once your chicken is just cooked through, remove from heat and allow to rest for about 10 minutes. Time to plate! 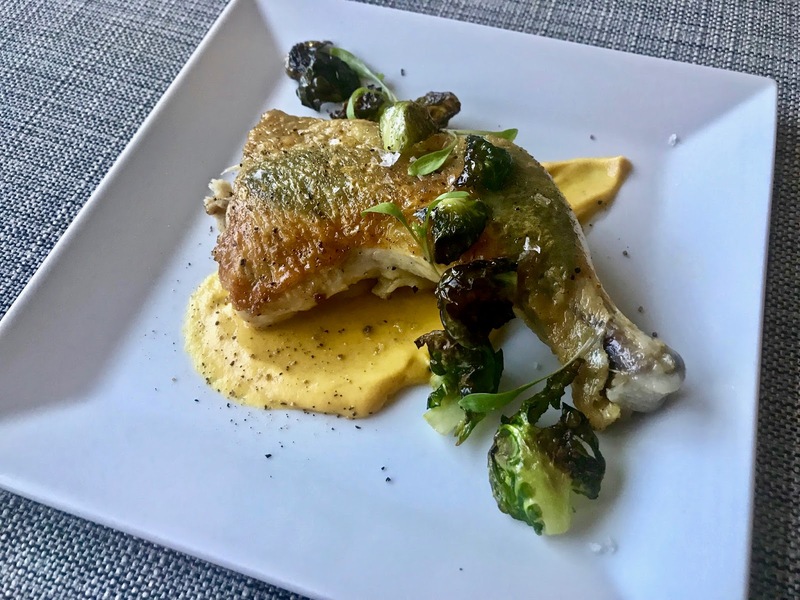 Take a bountiful spoonful of the puree and "swoosh" it down on the plate. Top with the crispy chicken, skin side up, so you can see the sage leaf on the inside. Finish with a sprinkling of the crispy brussels sprouts leaves, and ENJOY! This may be one of my new go-tos! We all know I have a strong affinity for chicken, especially CRISPY chicken, and this is a new favorite! The sage underneath, and basting with the thyme and garlic gives this an amazing flavor, without having to brine, marinate, or do any of that nonsense! 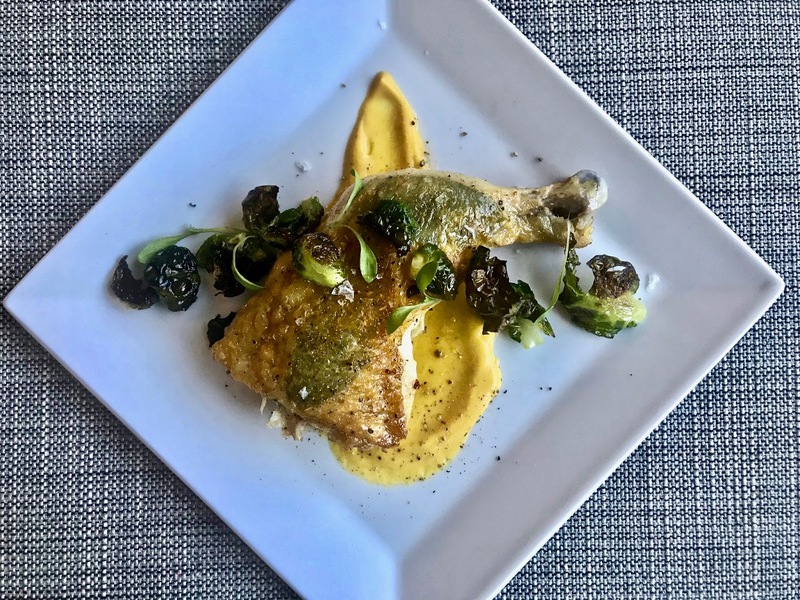 The flavors pair perfectly with the puree and brussels sprouts. The puree itself has a beautiful color, and brings a little bit of sweetness to the dish. The sprouts add a little more texture, and as stated before, a little but of a nutty flavor to the dish. Definitely a keeper! So delicious .. I made the cauliflower/pumpkin purée with salmon too!